They catch up to Monique and Stefan and Enzo decides to threaten Monique to demand the whole story. When Stefan doesn’t talk, Enzo kills her. Matt realises Stefan is bad and I guess this is the start of the Matt-becomes-a-hunter storyline. Liv uses magic and shinies to send Elena and Damon to the Other Side to find Bonnie (personally I would have sent Stefan since he’s older than Elena but that would have involved someone other than Elena). I do like him teaching Elena about pagers and, for one brief moment, actually pointing out the age gap between them. She also finds his video diary which he hastily takes from her. Bonnie gets in touch in response to the pager and she and Damon do the snark (they do give each other good snark). Alas, because Bonnie is clearly drunk, she’s excited to hear Elena’s voice and plans to get to them (she’s driving back from Portland). She confirms Kai has vanished. Damon realises that Kai already has everything he needs to escape and he probably already has. …oh dear gods that is so self-centred that Elena should have started imposing her own gravitational pull. Damon kindly explains to Elena that not everything is about her and the connection he forged with Bonnie while they were stranded together for 6 months. Elena realises the topic is not about her, so decides to talk about the time she burned her house down. Yes, they’re right – Kai is already in the Real World being his annoying self and murdering taxi driver because he can’t afford the fare. He has tracked down Liv to where she’s working at the bar. After a long afternoon of being annoying he finally reveals who he is by showing her his ID. He grabs her and does his magic drainy thing and she stabs him in the arm. He uses his stolen magic to stop her running though (Liv responds by pushing furniture around) until they end up on the mezzanine floor and Tyler pushes him over the balcony. They then decide to run rather than stab him repeatedly with sharp things. He’s just fallen off the balcony, you could at least drop something heavy on him! 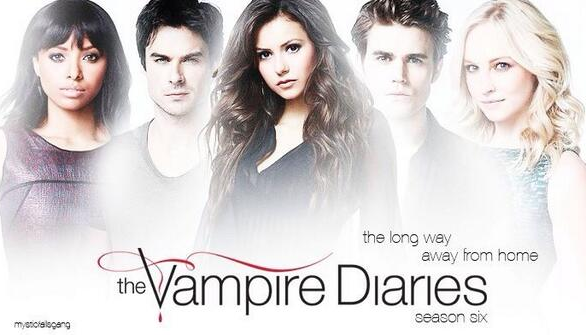 Instead they run out and summon Elena and Damon back – without Bonnie. Whyyyy?! At least Tyler and Liv are smart enough to be over the border and immune to vampire wrath when they do it. They then leave. No, really, why? Why bring them back just then? Will that stop Kai? …no, just the humans because he has no special powers in Mystical Falls either. They could actually call Alaric, Sheriff Liz, Matt, Tyler (all of which look physically more capable) to stab, shoot or maim Kai - or just handcuff and drag over the border. Except apparently not because Kai somehow manages to overwhelm Tyler with a broken glass (how does he even know where Tyler lives? Or who Tyler is?) He offers Tyler a deal. Elena calls Jeremy to tell him everything went terribly wrong – he is not surprised and blames Damon, just ‘cos. And Mat drops in to recruit Jeremy to become a vampire hunter; specifically hunting Enzo. Jo has realised her Ascendant is missing and that only Alaric knew where she kept it. He swears he knows nothing (honestly) and Jo realises what has happened – compulsion so they can use the Mystic Falls border to remove and expose the compulsion. On the Otherside Bonnie realises Damon and Elena are gone. Can we revisit again Elena now telling Jeremy, her brother who she knew was actually falling apart and becoming an alcoholic over his grief over Bonnie? Because she told him this episode. Last episode she found time to have a Thanksgiving Dinner and several romantic moments with Damon including some kind of waterboarding at the town boundary. But telling Jeremy that there’s hope and he can stop crawling into a bottle of bad American whiskey? Not a priority. I’ve said it before and will say it again, Elena is a terrible person. This season seems to be full of micro-storylines which kind of limp forwards then vanish. Like the hunters – we have hunters and then… not. It lasts for several episodes but doesn’t, quite, go anywhere. There’s Elena’s now ex love interest. Then there’s the vampired and now dead Holly. And Enzo… what is he even still doing in Mystic Falls? Why does he care so much about Stefan? Jeremy’s devastating grief is another. And now Sarah/Monique randomly going nowhere. And that’s not even including the 8 bajillion romances on this show. This season introduced 2 new WOC – Holly and Monique. Neither were developed, neither did anything, both were often ignored, both got murdered – by the same vampire no less. I’d say they’re disposable tools but to call them “tools” would be to imply they were used and discarded for a narrative purpose – but they didn’t even reach that height.